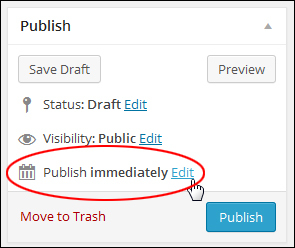 WordPress has a neat feature that lets you schedule posts. Lots of WordPress users don’t know about this. 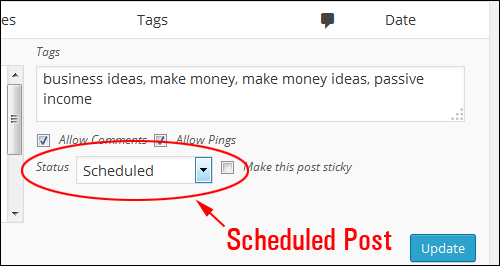 In this tutorial, we will show you how to schedule your posts in WordPress. 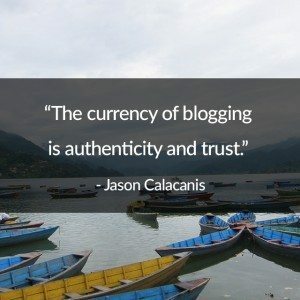 Publishing new content on your WordPress blog on a regular basis helps you get more pages indexed on search engines, drive new prospective customers to your business and keep your blog readers returning for more information. There are times, however, where you don’t necessarily want content to show immediately. You need to travel but you still want to publish articles to your blog while you’re away. You would like an already published post removed have it be automatically published again at a future date and time. You want to publish a daily update with the latest news about a certain subject for your blog readers, but they live in a different time zone than you. You’d like them to read your new post each day at a certain time, but this means that you’d have to be awake at odd hours of the night to publish your post. You set aside one day each week to write a whole week’s worth of content for your site, or you outsource your article creation to freelance writers who send you many articles each month, but you don’t want to publish all of your new content at the same time! You launch a private content membership area and want the content drip-fed to members over a period of time. Wouldn’t it be great if you could just add a whole bunch of posts to your website or blog in one go, and then have it all be automatically “drip-fed” to your readers so that only one new post gets published each day, or week, or every few days? 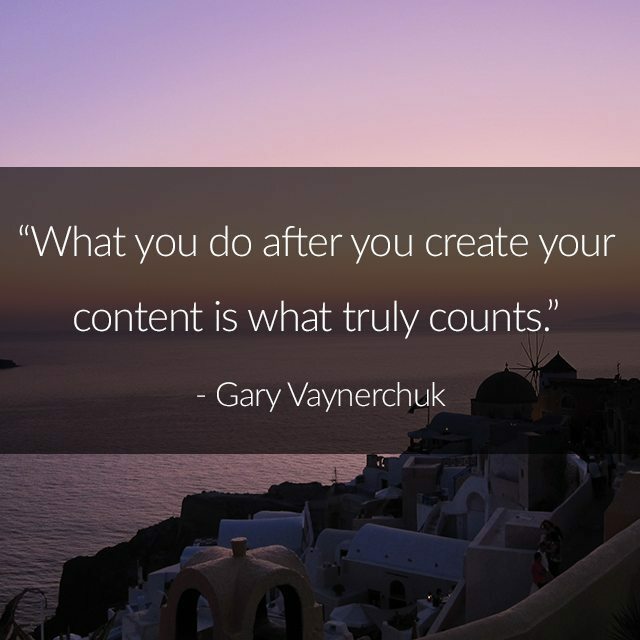 You could then implement a “set and forget” system for scheduling and publishing new content to your site that would keep your visitors regularly engaged, and be free to focus on other areas of your business … or go away for a while and know that your article strategy is still working for you while you’re gone. 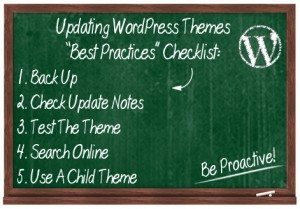 Well … with WordPress you can! 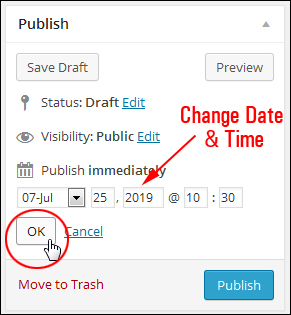 You can set a date/time in the future to publish your blog posts and WordPress will schedule and automatically publish or republish your posts on the exact dates and times that you have specified. 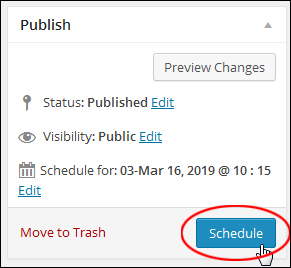 In the tutorial below you will learn how to schedule WordPress posts to publish at a later date/time, as well as tips for automating your scheduled articles. 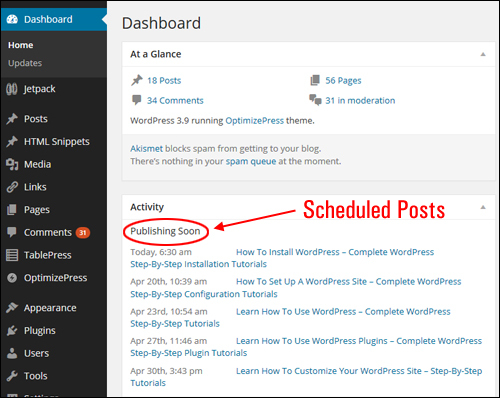 Go through the step-by-step tutorial below to learn how to schedule blog posts in WP. 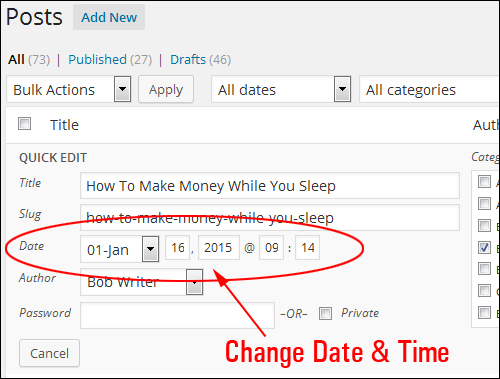 WordPress allows you to easily change the date and time of your published blog posts, including specifying dates and times in the future. 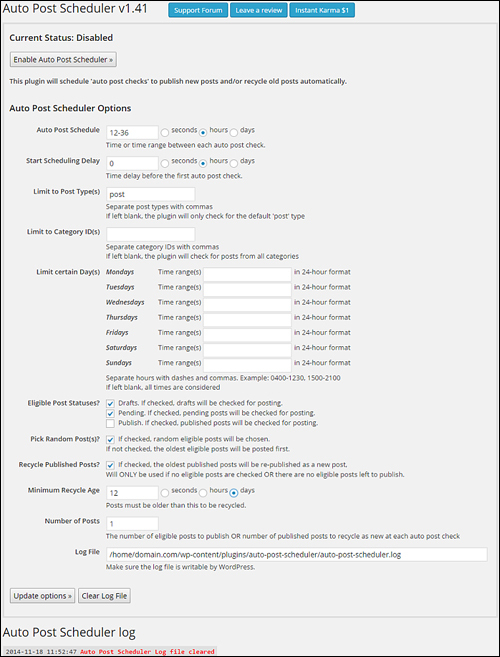 This lets you create or add posts to your WordPress blog, which can then be pre-scheduled to display live at any given date and time of your choice. 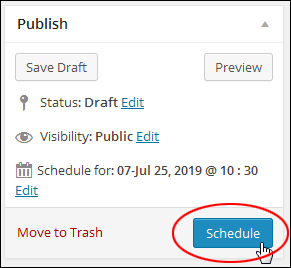 You can schedule existing posts to publish at a future time using the Quick Edit method if you are scrolling through a list of all your existing WP posts, or you can schedule them as you’re working on existing posts. 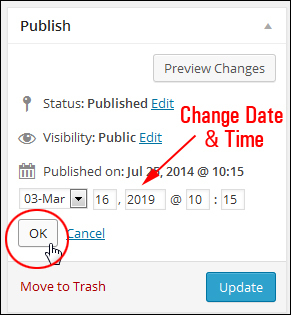 Tip: You can schedule blog posts in WordPress in the future or backdate post dates to show content as having been published prior to its original date of publication. This is very useful if, for example, you’ve been away and would like to publish an account of your experiences and would like your post dates to display as having been posted on the same dates you’ve been away. Another reason to backdate your posts would be to give a brand new website or blog a little bit more of an “established” look. 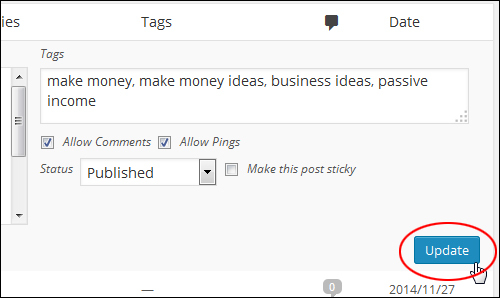 Alternatively, you can set all blog posts to publish in the future if you plan to launch a new blog at a future time. Note: To schedule a post as being published in the PM, you will need to use the 24-hour clock. For example, to display 1:00 PM enter 13:00 in the Post Scheduling area. The time your post will actually end up being published depends on the location settings specified in your Settings – General section. 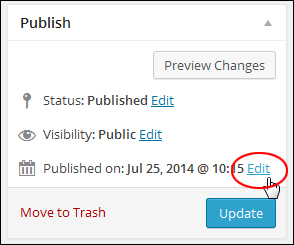 Note: To backdate a blog post, simply edit the date before you click the Publish button, as described above. In this case, the button will not change to Schedule. Congratulations! 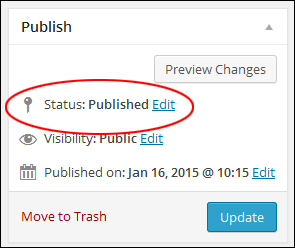 Now you know how to publish WordPress posts at a later date. 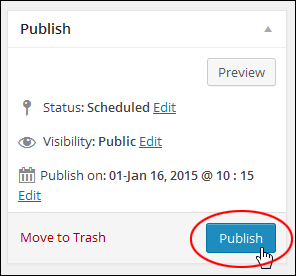 We’ll show you now how to republish existing WordPress blog posts. 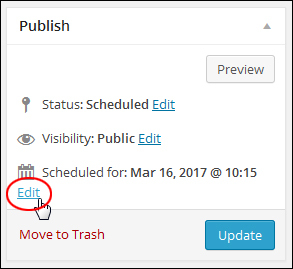 You can reschedule your post by editing the date and the time the post was published. Enter a futurelater date and time, then click Schedule. 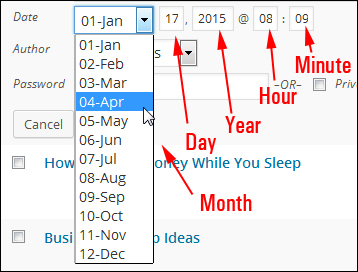 When the scheduled time arrives, the post will move from its current place in your timeline to the most recent spot on your blog and display the new date and time. The post link will also change to reflect the new publication date. Note: When you reschedule a post, it will not redistribute to your email subscribers. If you need the post to be redistributed to your email subscribers, use the option below. When you do this, the post will immediately redistribute to your email subscribers. However, the publication date and time will not change, so the post’s link and position in your timeline will stay unchanged. 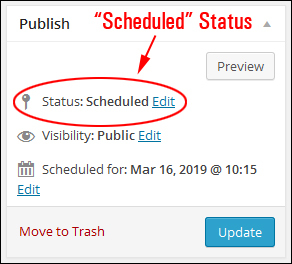 If you’ve scheduled a blog post to publish in the future, but changed your mind and decide to publish it immediately, just go back to the Edit Post page for your scheduled post. Is your timezone set correctly in your Settings – General section? Check your Post Status. 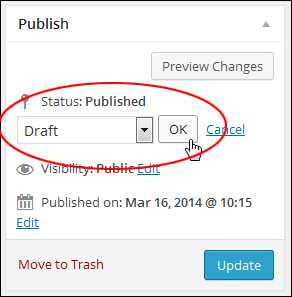 Have you saved the post as a “Draft” instead of scheduling it? 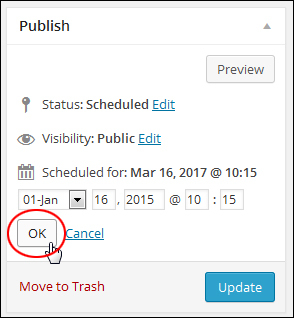 Did you remember to click the “Schedule” button after editing the date/time settings? For the post to publish, the Schedule button must be clicked. Did you schedule too many posts for publishing? 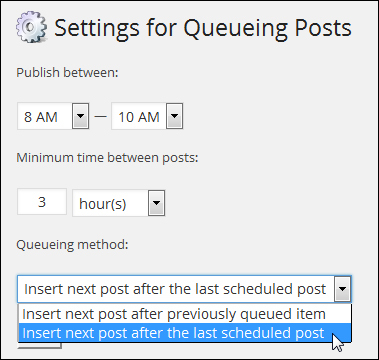 Are you using bulk post scheduling plugins to queue up thousands of posts? Depending on your hosting setup, you could experience problems. If so, try reducing the number of scheduled items and see if this solves the issue. 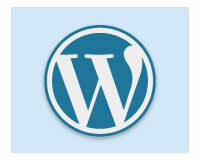 There are a number of WP plugins that let you “autopost” content (adding content automatically to WordPress blogs). 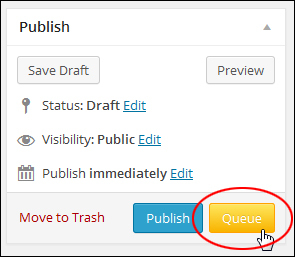 Use a plugin like Auto Post Scheduler to publish new posts and/or recycle old posts automatically. There’s no need to schedule post times individually and recycling older posts keeps your site looking fresh. 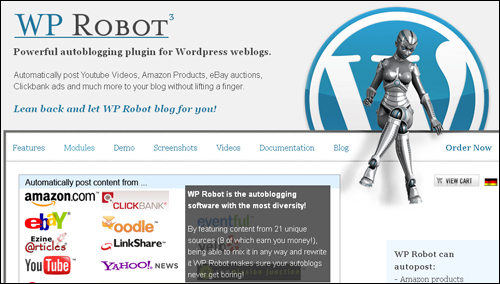 Although you may not want to use all of the features of an “autoblogging” plugin, a plugin like WPRobot includes a module that lets you bulk import posts or article files into your WordPress site, and then set these to automatically publish at regular or random intervals at a future time. Did you find this article useful? If not, how could we have improved it? Feel free to add your thoughts below and share this article with your friends. 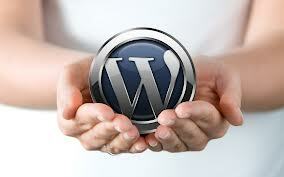 Disclaimer: We are not associated with WordPress or any of the WP-related products written about on this site. We may derive a financial benefit from sales of products advertised, reviewed or linked to from this site. All images used in this review have been sourced from the plugin’s own website.